Mark action off Scotland Island, Vino, Hooligan & Dark Star - photo by Ellen Pragnell-Rasch. Boats boats everywhere. Saturday afternoon on Pittwater and weaving through the MC38 Spring Pittwater Regatta race track to the north of Scotland Island are classic Couta boats, Etchells, and a fleet of keelboats contesting a Royal Prince Alfred Yacht Club inshore race. Back at the RPAYC Davies publicly thanked his ETZ teammate Adam Beashel, who coached the Menace crew on the waterway’s vagaries. “Adam was our coach the last time we were at Pittwater. He really helped us out with some local knowledge; I have to thank him for that.” Cheeky fella that Ray. As Hooligan’s tactician, Beashel finished second on the progressive pointscore to Davies. “About this time last year I gave Ray a lot of knowledge on this place. Now I’m regretting it,” Beashel smiled, playing along with the joke. l-r Kokomo, Hooligan & Vino - photo by Ellen Pragnell-Rasch. Ghost Rider upwind - photo by Ellen Pragnell-Rasch. 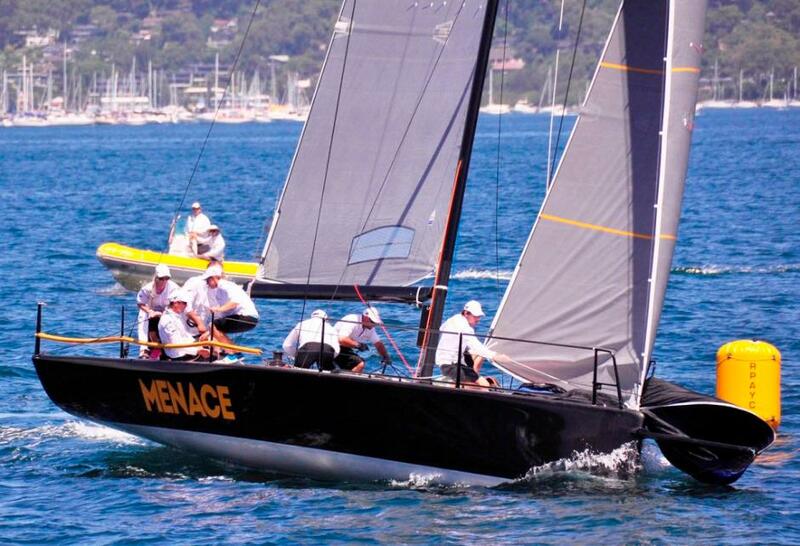 Summer regatta winner Menace - photo by Bob Fowler. 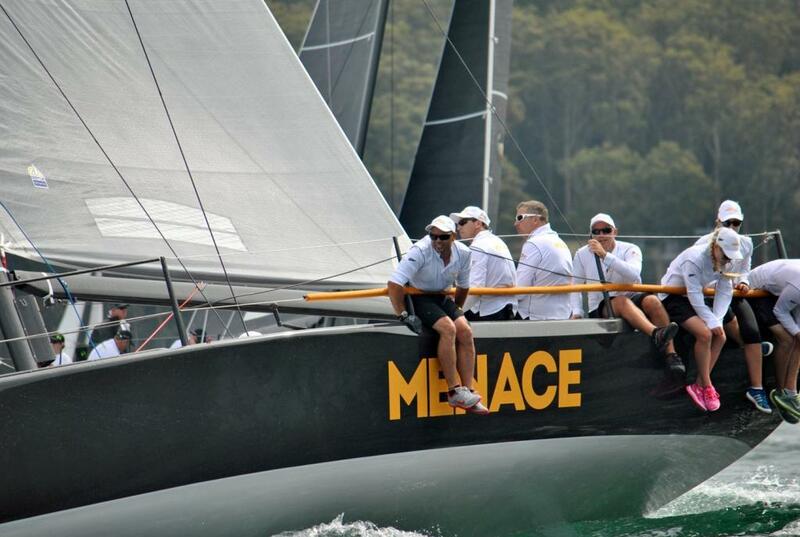 Howard Spencer’s Menace sailing for the Royal Akarana Yacht Club in Auckland opened its 2015 MC38 Australian Season Championship with a decisive 10 point break at the Summer Pittwater Regatta that wrapped up today, Sunday February 15, 2015. Victory was always the intention and the owner is delighted said boat captain Chris Reid this afternoon as those not on a flight back to New Zealand tonight packed up Menace for delivery back to Woolwich Dock. Sydney Harbour. “It’s a nice little jump to start with. We were expecting it to be a tightly fought battle, this fleet is packed full of great sailors. “We have a very good group on Menace. When you get into situations it’s not a big deal; there’s no yelling…it’s a happy boat.” As the Australian fleet lay idle over Christmas, Menace campaigned the Auckland summer. Time on the water combined with the talent and tactical nous of Ray Davies from Emirates Team New Zealand and other world class sailors delivered fat gains to the foreign entry. Second by 10 points was John Bacon’s local Dark Star, a win and a second bringing them up from yesterday’s third overall on progressive points, and the final placegetter in the seven-race series was Royal Prince Alfred clubmate Hooligan, skippered by Marcus Blackmore. 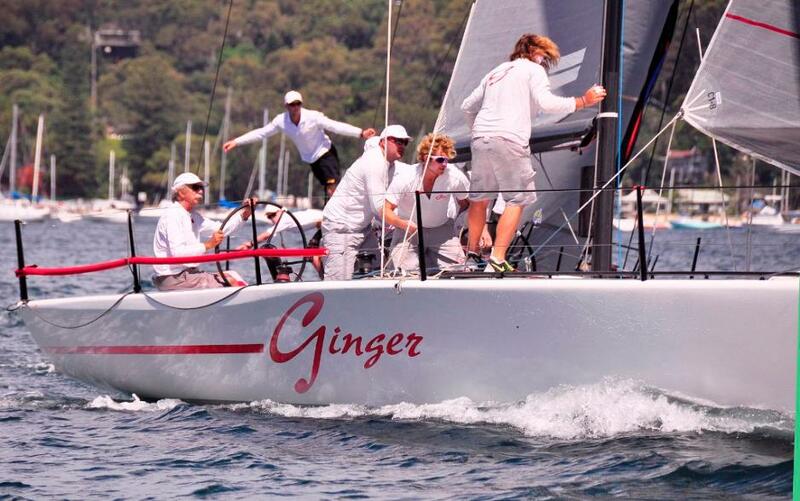 A full U turn for Leslie Green’s Ginger (CYCA) started with them in a wretched place yesterday, forced to send the rigger on board aloft to make temporary repairs on a mast track problem that cost two full race scores, and boat of the day today, owing to a win and two seconds. On their stunning comeback Ginger’s tactician David Chapman said, “it was great the boys re-grouped. Will Parker from Sydney Rigging did a terrific job to get us racing again yesterday. We would have liked a top three finish overall but that wasn’t realistic after what happened with the mast track. We are happy with fifth. “Menace is a bit crisper than us. It’s time on the water and they’ve had a full summer racing in Auckland. They menaced us on and off the water,” Chapman added, hinting at the team’s customary après racing bonding sessions, one of the key reasons the Menace crew perform so well when the gun goes, according to Davies. Prominent offshore yachtsman Gordon Maguire’s first try out of an MC38 came as tactician of Chris Hancock’s Vino (MHYC) which finished fourth on the table. Maguire has oodles of cred, but on this tickled-up one design there’s a lengthy breaking in period to get the high-strung beast to cooperate. “Gordon did a really really good job; he also had to start to learn the boat while we were racing,” said Hancock. Principal Race Officer Steve Merrington and his team hosted another superb series for the eight boat fleet over two days in tricky nor’easterly sea breezes up to 17 knots yesterday and lighter today, up to 10 knots and fluky. 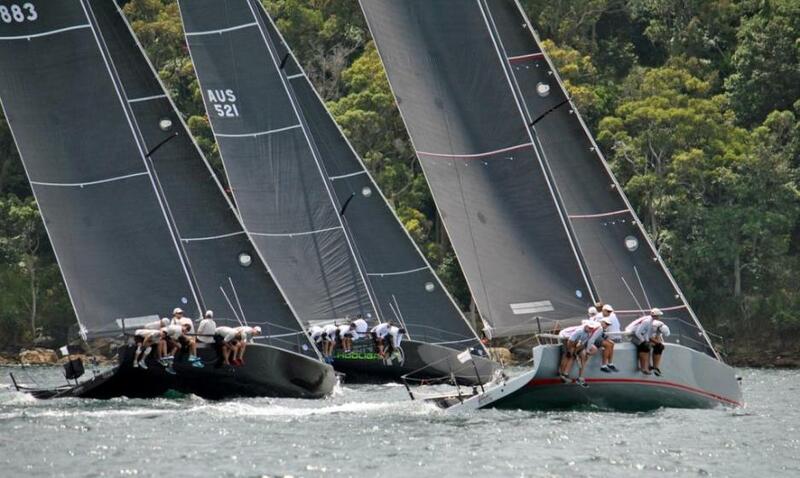 They’ll be back out next weekend for the Sydney Yachts Pittwater Regatta incorporating the Sydney 38 Australian Championship starting Friday, February 20th. 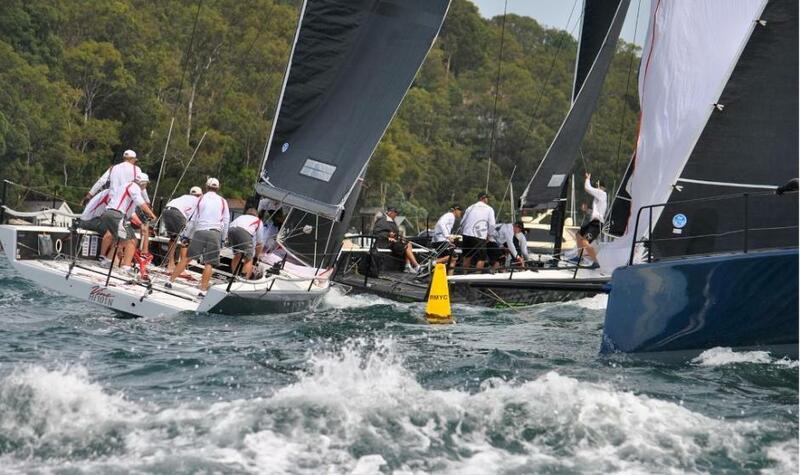 “It’s great to see so much one design racing back on Pittwater being run by the RPAYC. Next weekend will be even bigger with 20 Sydney yachts entered,” Merrington promises. 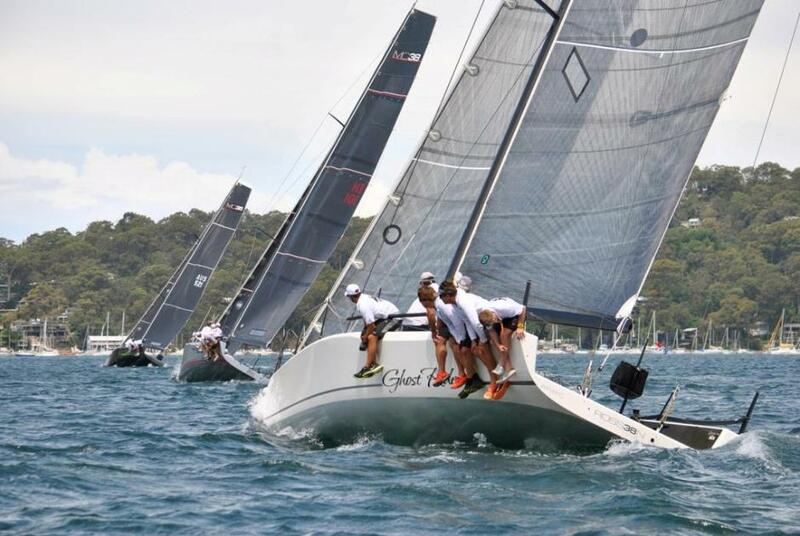 A decision will be made shortly on whether the MC38s are to be listed on Middle Harbour Yacht Club’s Sydney Harbour Regatta program next month. If not then the standalone Australian title on Pittwater over the weekend of April 10-12 will be the class’ next gathering. Ginger boat of the day Day Two - photo by Bob Fowler.